Latin Name: Peronospora belbahrii sp. Life Cycle: This pathogen is a water mold. It can spread as sporangia blowing on the wind, infected leaves, or seeds. Zoospores emerge from sporangia and have to have water to infect leaf tissue. Mature infections produce more sporangia. With a hand lens, the fruiting bodies resemble small trees with fruit on them. Plants effected: Basils (unknown at this time if there are other hosts; a different pathogen causes downy mildew in coleus, sage and mint). 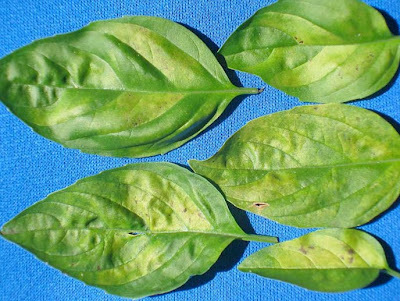 Symptoms: Slight yellowing on upper side of leaf, often in bands because the pathogen cannot grow through major veins but sometimes subtle, resembling nutritional deficiency. Monitor closely for white, gray or black 'fuzz' on under side of leaf. Small stalks with sporangia, resembling mini fruiting trees, can be seen with a hand lens. 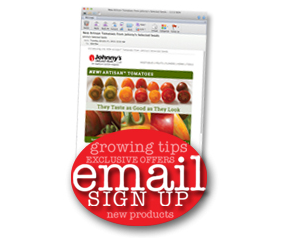 Control: Start with pathogen-free seed. Keep foliage as dry as possible. Plant basil in a sunny location with good air movement and space plants as far apart as possible. Use our 9900 (18 Oz.) or 9804 (2 Oz.) Actinovate as a foliar spray to prevent zoospore infection. This is a new disease to North America (first observed October 2007 in FL). Testing procedure for the pathogen in seed is being developed. 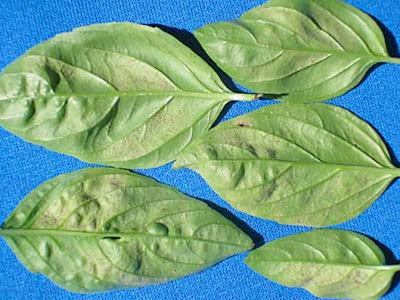 If you find Basil Downy Mildew or suspect you have it, call your local extension office or send a plant sample to your state's plant disease diagnostic lab. As we learn more about it we will be sure to update this sheet with new management strategies and control methods. 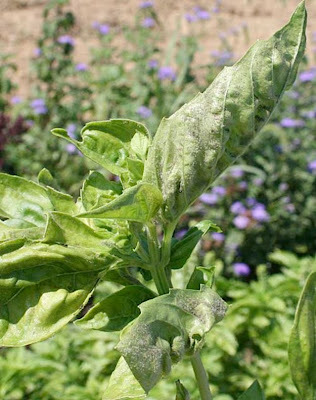 What is happening at the seed testing level for Basil Downy Mildew? At this time researchers at U Mass are working on a testing procedure for Basil Downy Mildew. Robert L. Wick is the professor leading this effort. 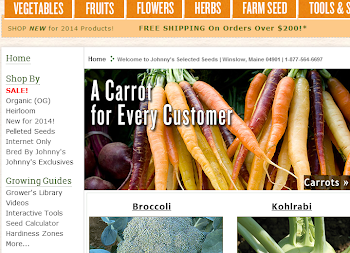 We at Johnny's have been and will continue to be in communication with him. We will update our website and blog when we find out about any new information.